The first burials took place in the Oak Grove Cemetery in about 1860, with the first known deed having been registered to Daniel W. Bigelow in about 1859. The first burial is believed to have been that of Edmund Crapp, who was buried in August 1852. Edmund was a two-year-old child, having been born in October 1850. It is very likely that he was initially buried elsewhere, and then re-buried in the Oak Grove Cemetery in the early-1860's. The cemetery's earliest recorded death is that of Jane Z. Barnes, who died in March 1833. It is almost certain that Jane was originally buried elsewhere, and then re-buried in Oak Grove when her cemetery plot was purchased by L. Barnes in 1918. Click the link below to view and print a report of the cemetery's earliest dates of death. There are 243 pages in the entire report, but you can print specific pages by clicking File, Print, and specifying the page number(s). As of January 2003, the Oak Grove Cemetery contained the known graves of 6,850 individuals--nearly as many as the 9,000 or so residents that live in Tomah at the present time. It is by far the largest cemetery in the area, and—many would say—the most beautiful and best maintained. Below is a link to a report of all of the known decedents who were buried in the Tomah Oak Grove Cemetery through the end of 2002. The report consists of an alphabetical list of the decedent's surname, given name (or initial), dates of birth and death (as listed in the cemetery records), and the Section, Block and Lot where the decedent's grave is located. There are 264 pages in the report. The link below is to a report of all of the 2,173 known owners of lots in the Tomah Oak Grove Cemetery. The report consists of an alphabetical list of the owner's surname, given name (or initial), the date of the deed for the lot, and its Section, Block and Lot location. There are 84 pages in the report. There are 15 lots in the cemetery for which the owner is not known. Below is a link to a one-page report of those lots, including the name of the decedent(s) buried in the lot and its location. 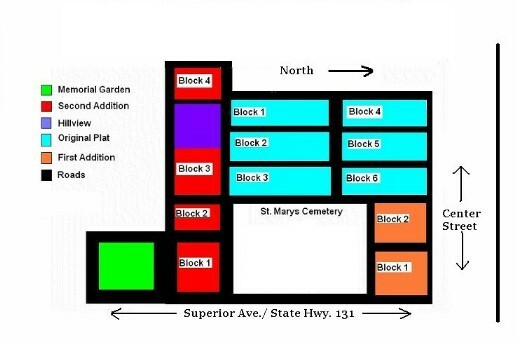 Most of the lots are in the Original Plat (OP) section of the cemetery. We hope that you find this website's information to be useful in locating a decedent or a cemetery lot that you may be searching for. If you are aware of any errors in our data, or have additional information to add (e.g., complete given name, maiden name, full date of birth or death, etc. ), please let me know. Special thanks go to Marie Drescher, who compiled and maintained the cemetery records for many, many years and who allowed us to make the information available. She was succeeded in that position in 2002 by Bonnie Dana, and we thank her for her help as well. If you are interested in finding out more information about cemetery records, contact the Tomah Oak Grove Cemetery Foundation. Follow the first link below to get to a website that contains reports on nearly 400 families that settled throughout Monroe County in the mid- to late-1800's; the reports on those sites contain many present-day Tomah-area families. The second link leads to a website that commemorates the many families in the Tomah area that descend from the Pilgrims and “Strangers” who were passengers on the Mayflower. Many present-day Monroe County families are listed on that site, as well. The third link leads to a website that contains several reports of the earliest (1862-1889) births, baptisms, confirmations, marriages, deaths and burials that are recorded in the Parish Register of St. John’s Evangelical Lutheran Church in Ridgeville Township. The fourth link leads to a website that contains information on families related to the Griggs family of LaGrange Township and the Pergande family of Ridgeville and Wilton Townships.